Wednesday was another picture perfect day much like the ones that came before it. Eat. Beach. Drink. Repeat. That about sums it up. We'd roll out of bed around 9:30am, go to breakfast at Flavours then hit the beach. We actually started out in the lazy pool area. We missed the breeze and the view and at one point I had a random worm on my leg so we switched over to the main pool. MJ played volleyball again (of course). I felt lazy so I got him to take a walk with me; this time in the other direction. We relaxed the day away breaking for lunch until it was time to get ready for dinner. The days are longer there so we didn't stay for sunset the way we did in Hawaii but we were always one of the last ones there. It doesn't get much better then this!!!! There were lots of families at Azul Fives. Whenever I see a traveling family I imagine that they must be rich. I look at these kids traveling to Hawaii or Mexico and think how lucky they are to get to have these amazing family vacations and on their parents dime. I couldn't even imagine such trips at that age. I mean, I know it's all relative and I don't know their finances but I do know that when I was a kid my parents couldn't afford to take us on expensive trips. Most of our vacations required spending a really long time in the car and mostly, to visit family. We piled in and drove nine hours to San Jose and days cross country to Michigan. It actually traumatized me. I remember crying whenever my Dad got on the freeway because I thought we were going to be in the car for five days. Looking back, I still can't believe we did that but I know why. Airfare is expensive. Hotels are expensive. Amusement park tickets are expensive. They took us on short trips to Rosarito, Mexico and Palomar Mountain but anything beyond that was just too much money when you have to multiply it by four or five. I think of how much it costs for MJ and I alone to take a trip and I'm pretty sure that if we had kids we wouldn't be and they would have to wait until they grow up and can afford to go on their own just like we did. I was so pumped when I found out it was Karaoke night that I was the first person to sign up. I consider myself a shy introvert but if there is Karaoke going on I'm all over it. It's yet another thing about myself that is totally at odds with my personality. I think I was meant to be a singer but genetically something went wrong so there is a singer trapped inside of the body of someone who can't sing. I did two songs but I wanted to do more. I went 80's with Heaven is a place on Earth by Belinda Carlisle and I Think We're Alone Now by Tiffany. I know, I'm really cool. There were actually some really good singers that night. I was not one of them. As usual MJ will not participate. He sits there and watches me with a mildly amused look on his face which is fine as long as he's not laughing. We really lucked out on the weather. It's rainy season there but we only caught one day of rain. One perfectly wonderful day that we got to spend sleeping in even later then our usual 9:30, ordering room service and watching our two English TV channels in bed. We went to the gym around 4ish for our 2nd and last work out of the trip before dinner. Our reservations at the Japanese restaurant weren't until 7:30pm so we went to Sea Olive for a pre dinner snack and drinks. MJ spent a year in Korea. He learned how to eat with chopsticks out of necessities but I still have to ask for a fork. It would take me forever to eat a meal using only chopsticks. That night in the Zky Bar they had a really good break dancing group perform. It was another great show at the end of another great vacation day. OMG! Your tan is getting better and better. Wow! Now that is a fabulous vacation. I just love the look on your face while you're trying to keep the food on your chopsticks...lol. I would never be brave enough to stand before a crowd and sing so, You Go Girl! Looks like so much fun! I love all inclusive resorts. When we were kids, we were really lucky that my grandparents lived in a fun, touristy area (Williamsburg, VA), and they had a beach house 3 hours away from their house. Without that, we would have never gone on vacations, because there's no way we could have afforded spending all that money on airfare, food, and lodging. Our family vacations were similar to yours growing up. My parents would take a week off work, and we'd visit different amusement parks each day, or take a road trip (vegas, san francisco, rosarito, redwoods, san diego, TJ, etc). I didn't feel deprived. One year, we went to Hawaii and I felt SO rich! Some all inclusives offer children to stay free, so all you pay for is the airfare. Makes for a better deal. I always think the same thing when I see families on cruises or at resorts, because I never saw the Caribbean or anywhere outside of New England really until it was on my own dime. ALSO, I'm a little bit jealous of that first picture. Hello gorgeous beach! Have enjoyed your vacation updates! Eat. Beach. Drink. Repeat. Sounds like a great mantra to me. Hope y'all continue to have a great time! Your pictures are perfection! Looks like such a great time. I had to learn how to use chopsticks because I love sushi and my older sister would make fun of me if I asked for a fork! karaoke huh? i never would have guessed? I'm awful at it...AWFUL. looks like a fab time! Me + Chopsticks = MASSIVE FRUSTRATION. I can not believe you do karaoke!! I would never have guessed! 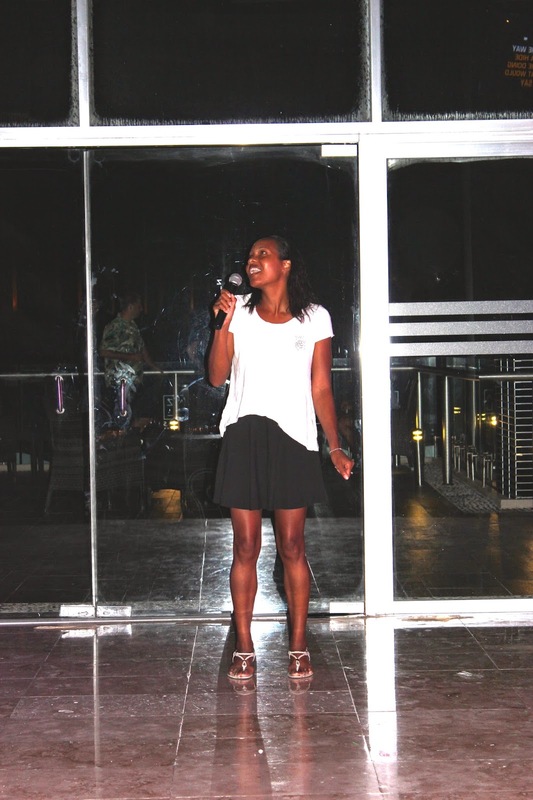 I love to sing too, and did karaoke in a group once which was enough for me. Being up in front of people makes me nervous! Ohhh all inclusive vacations really are the best. I can't wait until Garrett and I can vacation somewhere together again. Looks like so much fun! Ps. Chopsticks are impossible!